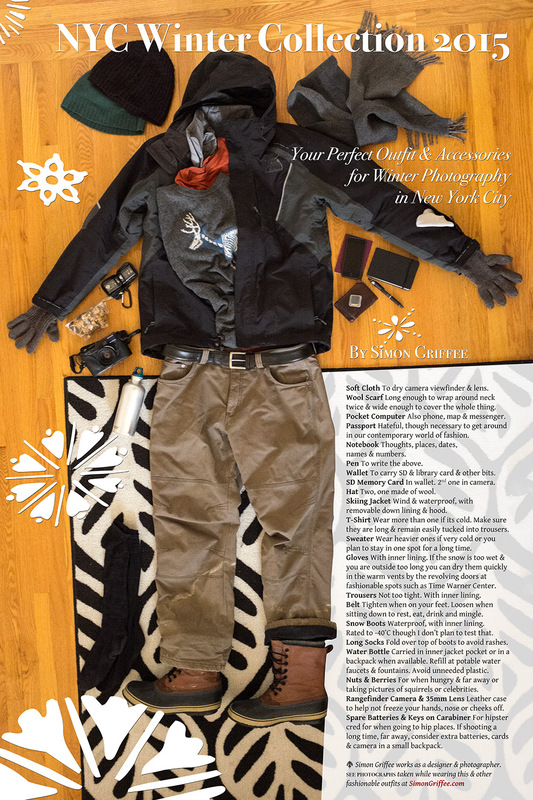 Your Perfect Outfit & Accessories for Winter Photography in New York City. Soft Cloth To dry camera viewfinder & lens. Wool Scarf Long enough to wrap around neck twice & wide enough to cover the whole thing. Pocket Computer Also phone, map & messenger. Passport Hateful, though necessary to get around in our contemporary world of fashion. Notebook Thoughts, places, dates, names & numbers. Pen To write the above. Wallet To carry SD & library card & other bits. SD Memory Card In wallet. 2nd one in camera. Hat Two, one made of wool. Skiing Jacket Wind & waterproof, with removable down lining & hood. T-Shirt Wear more than one if its cold. Make sure they are long & remain easily tucked into trousers. Sweater Wear heavier ones if very cold or you plan to stay in one spot for a long time. Gloves With inner lining. If the snow is too wet & you are outside too long you can dry them quickly in the warm vents by the revolving doors at fashionable spots such as Time Warner Center. Trousers Not too tight. With inner lining. Belt Tighten when on your feet. Loosen when sitting down to rest, eat, drink and mingle. Snow Boots Waterproof, with inner lining. Rated to -40˚C though I don’t plan to test that. Socks Long ones. Fold over top of boots to avoid rashes. Water Bottle Carried in inner jacket pocket or in a backpack when available. Refill at potable water faucets & fountains. Avoid unneeded plastic. Nuts & Berries For when hungry & far away or taking pictures of squirrels or celebrities. Rangefinder Camera & 35mm Lens Leather case to help not freeze your hands, nose or cheeks off. Spare Batteries & Keys on Carabiner For hipster cred for when going to hip places. If shooting a long time, far away, consider extra batteries, cards & camera in a small backpack. Simon Griffee works as a designer & photographer in New York City. See photographs taken while wearing this & other fashionable outfits here at SimonGriffee.com. Simon is also on Instagram & Twitter.